Hi there! Thank you for stopping by. I'm going to be real quick with my post - the sketch is up at Tuesday Morning Sketches. I have to admit that I spent the weekend making Easter box cards for my family that I didn't get to my TMS card until Monday evening. I still like the way this came out, but I think it needs a bit sparkle. The sentiment is actually a long vertical sentiment so I did cut it apart to have it work on this oval piece. I love gray and yellow together and with the little touches of sky blue, this card went together relatively easy. The paper choice was the color inspiration. As I said - this is a quick post. Be sure to come join us and please visit the team's blogs and leave them a little love. This is a really pretty color combo! 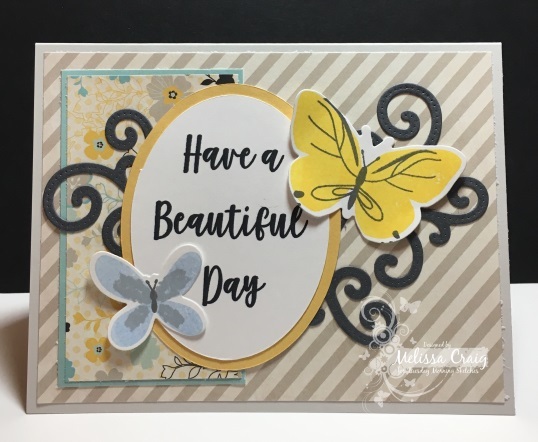 That flourish die cut goes perfectly with those beautiful butterflies. Love the colour combo and the butterflies over the scroll die. A Beautiful card. I really love your paper choice and the color is one of my favs too - it's a great card!! This is so pretty!! Pretty papers, pretty stamps, and pretty dies! !